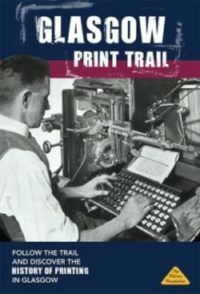 All Scot­tish Print­ing Archival Trust pub­li­ca­tions are can be pur­chased through the online shop. If you pre­fer, you can down­load a pub­li­ca­tions order form. New for 2018: the Glas­gow Print Trail leaflet. The Trust has also pub­lished an Edin­burgh Print Trail leaflet and a fac­sim­i­le poster of print­ing chapel rules from the eigh­teenth cen­tu­ry Rules for Com­pos­i­tors. Some com­pa­nies pub­lished his­to­ries to com­mem­o­rate mile­stones in their devel­op­ment. The Trust has scanned or tran­scribed a num­ber of these, which are avail­able on the Print­ing Com­pa­nies page. Brochures and cat­a­logues pro­duced by sup­pli­ers to the indus­try can also shed light on indus­tri­al prac­tices. Unions also pro­duced rule books and peri­od­i­cals for their mem­bers: again some of these have been scanned and are avail­able on the Trade Unions page. Online exhi­bi­tions and oth­er web­sites of inter­est are list­ed on the links page through the menu on the left. Insti­tu­tions across Scot­land have mate­r­i­al in their col­lec­tions rel­e­vant to the print­ing and allied trades — a list of those iden­ti­fied so far can be found on the archives page. The main menu has a link to our bib­li­og­ra­phy of works on the Scot­tish print­ing indus­try. Copies of the Trust’s Annu­al Reports, and copies of the print­ed newslet­ter are avail­able to down­load.